It is with great sadness that we learned today of the passing of people’s lawyer, human rights defender, international jurist and founder of the Public Interest Law Center Atty. Romeo Capulong. He had been confined for some time at the Medical Center Manila. Last August, Beng and I went to the hospital to donate blood as he needed transfusion. We were not able to visit him at the room but his grateful daughter was there to meet us at the blood bank. I first met Atty.Capulong at the Public Interest Law Center office in Makati, sometime in the late 90’s when we needed to consult the case of student activists from Lyceum who were facing sanctions from the school administration. We were still with Anakbayan at the time. At the get go, Atty. Capulong clarified that whatever legal tactic that would be employed, that would be secondary to the political movement. He told us of the primacy of the political struggle, that this was the most decisive, and that the legal tactics should serve the political tactics. That conversation stuck with me. I was fortunate to get a chance to see up close what he meant, and to appreciate the correctness of his words. Atty. Capulong would provide important legal inputs in the Estrada impeachment, and led the walk out of private prosecutors when the Senate refused to open the second envelope related to the Jose Velarde account. Atty. Capulong would also be visible as a legal counsel for the negotiating panel of the National Democratic Front of the Philippines. He would be present, along with some government officials, during the releases of prisoners of war . 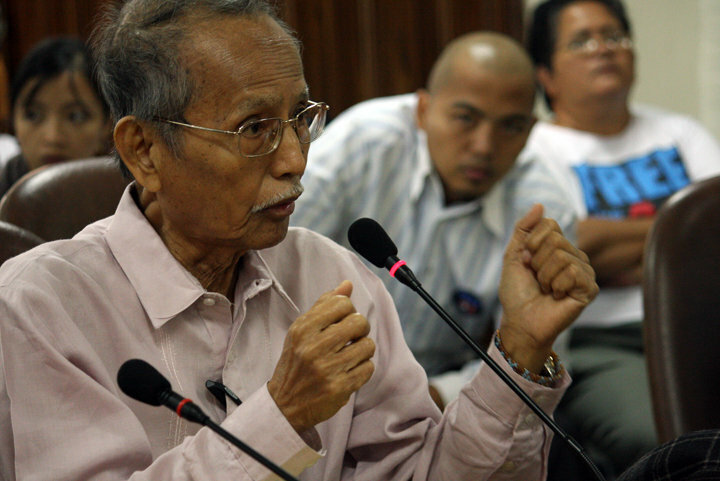 Ka Romy would play a leading role in the legal battle for the release of the dropping of the charges of rebellion against the Batasan 6 and other accused. We won that fight and the rebellion raps were dismissed. This paved the way for the release of Ka Crispin Beltran who was still under arrest at the time. The Supreme Court decision junking the sham rebellion raps filed against activists during Gloria Arroyo’s state of emergency in 2006 is a major legal victory for human rights, especially at a time when the regime used the non-bailable crime of rebellion to detain activists. I had the opportunity to see Ka Romy visit Ka Bel at the Philippine Heart Center before the decision came out. Bukod sa lawyer-client, magkumpare yung dalawa. Ka Romy assured Ka Bel of the correctness and necessity of the pursuing the case before the Supreme Court, even if it meant being under hospital arrest for some time. I saw how Ka Bel had full confidence in Ka Romy. I saw Ka Romy stand before the Supreme Court for several hours arguing the case of Ka Satur Ocampo when the later was arrested in 2007 on the trumped up charge of murder. Ka Romy ably answered the queries of the justices as he pointed out that not only were the charges fabricated, they should also be subsumed under the charge of rebellion which Ka Satur at that time was already facing and which the SC had yet to decide. Ka Satur was granted bail as a result of that legal action. Ka Romy would again play a leading role in the legal defense of the Morong 43 who were arrested in February 2010. It was his idea to bring the case both to the Supreme Court and the Commission on Human Rights. When the writ of habeas corpus was granted, it was Atty. Capulong who stood before the Court of Appeals to argue the case and to condemn the failure of the AFP to bring the detained health workers to court. He stood up to demand that the handcuffs of the detainees be removed while they were in court. He spoke eloquently on how the rights of the 43 health workers were violated from the moment the warrant of arrest was issued up to the time they were arrested and detained without access to counsel, and made to go through a bogus inquest proceeding. Atty. Capulong also spoke before the Commission on Human Rights, then chaired by Leila de Lima, on the violations of the rights of the health workers. There were times when doubts crept in regarding the legal tactics employed by Atty. Capulong. Some though there could be a more convenient and expedient way out. But Ka Romy pointed out that what appeared convenient or expedient at first would turn out to be more problematic in the end. During the struggle to free the Morong 43, there was a suggestion to explore the possibility of the detainees posting bail. Posting bail however would mean going through arraignment and thereby legitimizing the illegal proceedings that the health workers were subjected to in the first place. It would eventually compound the problems of the detainees. Ka Romy pointed out that we should give primacy to the efforts with the Supreme Court and the ongoing DOJ review. He explained to the detainees the need for patience, for determination, and for the intensification of the political struggle, even as the lawyers pursued the agreed upon legal tactics. But he never imposed his views on the detainees. Bail was a matter of right after all. He presented the two sides of the story and asked his clients to decide based on the presentation. He was proven right though. The health workers were released on the strength of the mass movement after the DOJ concluded its review and withdrew the cases filed against the Morong 43. He was right that the health workers not go through arraignment. He was right in pointing out the primacy of the political struggle even as he upheld the correct legal tactics. During these times of doubt, he himself would go to Bicutan and explain to the detainees of why such was the tactic employed and its relation with the political struggle. But before he started with the legal briefing, he would first make a self-criticism on why he and other lawyers could not visit the detainees as frequent as possible. Such was the humility of the man. I last spoke with Atty. Capulong, on the phone, during the impeachment of Chief Justice Renato Corona. He gave important tips on what the mass movement can do in relation to the Senate trial. “Di tayo pwedeng bumitiw dyan,” he told me. He also correctly predicted that the Supreme Court would not allow the opening of the Corona dollar accounts and that the Senate would not defy the Supreme Court on this. He told me of the influential forces such as the big banks, the big business interests embroiled in the Senate trial as well as foreign interests that would be affected. Madami pa akong pwedeng maikwento tungkol sa abogadong ang tawag ng marami ay RTC. Nagmartsa din sya nung panahon ng CPR ni GMA. Laman din sya ng kalsada sa maraming mahalagang pagkilos. Sigurado akong marami ding kwento kaugnay ng mahalagang papel niya sa usapang pangkapayapaan. Pag si RTC ang humawak ng kaso, parang kagyat na panatag ang loob ko. Ang dami na nyang dinaanan, at nakitang pakikibakang legal, at pag nagsalita sya, sigurado sya sa sinasabi nya. Sayang, hindi na rin sya umabot sa 40th anniversary ng Martial Law sa September 21. Alam kong marami ding kwento ang mga Marcos victims kaugnay ng papel ni RTC sa laban para sa katarungan. Oo nga pala, yung mga migrante, may mga kwento din sila sa naging papel ni RTC sa kaso naman ni Flor Contemplacion. Ang daming kwento talaga. Sa mga bago at nakababatang abogado ngayon, mainam na makilala nyo sa Atty. Romeo Capulong, abogadong naglinkgod sa bayan hanggang sa huli. Napakahusay na huwaran para sa mga future lawyers. To RTC, our most militant salute, and most heartfelt appreciation. Salamat, Sir. Isang, karanganlang makilala at makasama kayo. We honor you by carrying on with the unfinished struggle, until victory.